Compare prices from multiple car hire suppliers in Faro Airport to find the best available deal. A few of the car rental companies we compare include Gold Car, Budget, Avis, Hertz, Sixt and many more. 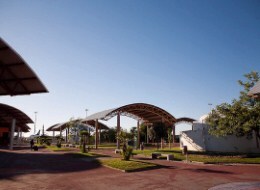 Faro Airport (FAO) is located 2.6 kilometers from the city of Faro, Portugal. During the summer months, especially between March and October, the airport can get extremely busy due to tourists coming in from all around Europe as well as the rest of the globe. In 2010, there were 39,629 airplanes that landed and took off from the Faro Airport. The airport serviced approximately 5,342,707 passengers in the same year. It is considered to be one of the busiest airports in the entire country. The airport offers its services to both domestic, international, and charter flights. Airlines that provide services to Faro Airport include Aer Lingus, Air Berlin, British Airways, EasyJet, Lufthansa, Luxair, Ryanair, Thomas Cook Airlines Belgium, and Scandinavian Airlines. Once visitors arrive to Faro Airport in Portugal, there are a number of amenities that they may be interested in, including some excellent shopping opportunities, car rental kiosks, and areas to receive tourist information about the area, including what there is to do, where to eat, and where to stay.